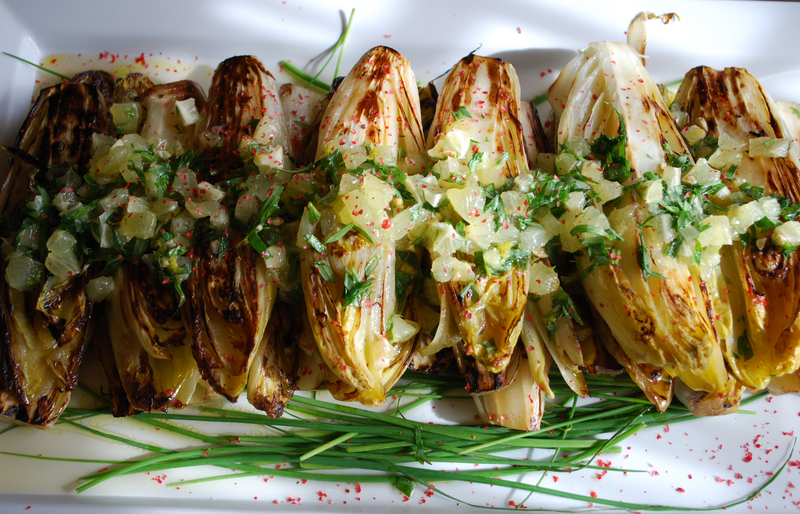 Winter's here and it's a great time of year for an endive side dish. Enjoy this recipe created by our legendary Chef Jonathan Sheridan for Braised Endive with Lemon Tarragon Vinaigrette. Trim the outer leaves and the end of the stem of the endive. Cut in half and put into a stainless steel pot with water (just enough to cover). Add the rest of the ingredients and gently stir together. Take a clean kitchen towel and place on top of the water, then place a clean plate on top of the towel, (which will be used to keep the endive submerged while it 's cooking). Cook the endive over a low flame, barely simmering, for 20 minutes. Test with a knife for doneness - if the knife offers no resistance, they 're perfectly cooked. With a pair of tongs, gently remove the endive and put on a rack to drain with the open side down so all the water can drain out. Take a heavy bottom saute pan and turn the heat up all the way, add 1/4 tsp olive oil and quickly place the endive, cut side down in the pan and sear for 3 minutes to allow them to caramelize. Remove from the pan and put on a platter to be served. Mix all ingredients together and spoon over endive. Dust with some crushed pink peppercorns.